The weekend chosen to go camping is a tradition among the Ray Family, CUPMATCH WEEKEND…on this particular weekend it’s a holiday, much like Memorial Day Weekend in the U.S.A. It’s also a common weekend that campers use to escape the hustle and bustle of life as it exists on a small island. Imagine with me, if you will…It was the summer of 2010, between July 31st to August 2nd … My camping experience up to this point was minute at best, and or non-existent at worst. Admittedly, my experience as a camper was limited to a small campsite in the city of San Diego. The greatest challenges we faced were red ants that bite, sleeping on the hard ground for one night, and the excessively loud traffic nearby. Who would have guessed that my camping experience on a little island, would forever COLOR my experience of camping? I can laugh about it now, but it certainly wasn’t funny then! 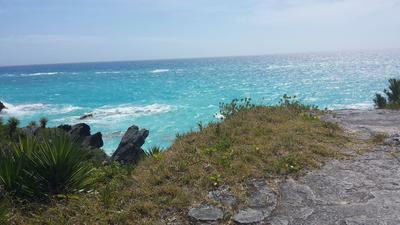 It was my last weekend before leaving Bermuda and heading home back to the states. I was torn, because of my limited camping experience; and, because honestly, I am not a fan of outdoorsy time activities. Nevertheless, since my daughter and son-in-law had decided to go on this “adventure”, I went along with them, to be with them.. Considering how beautiful Bermuda is, I figured, “How difficult could camping in Bermuda be?” Honestly, I couldn’t think of anyone from my neck of the woods, Southern California, being able to boast about camping on an island surrounded by waters so clear and so blue, along with wonderful family and everything you could imagine when it comes to camping in style. There were two tents; One which, had been tested, tried and found durable, and a second one, which had been purchased a day or two before. Our experienced camp leader, Liz (my son-in-law’s, mother) had brought all the amenities besides the two tents: rope, extra tent pegs, tarps, hammers, lanterns, plates, cups, silverware, a basin for washing dishes, dish cloths, a bag with rinse water, a camping potty, a camping shower; ice chests, and ice to keep the food.